Here's the story with the Lexus Catching fire. The heads blew a few weeks ago, I Spent extra time cleaning up all the parts while I was in there, Put sealant goop on the intake gaskets, and adjusted the timing tension better than id done previously. Basically I took extra time to do a good job, not just slap new head gaskets in and move on. Id gotten about 3 miles into the drive then I smelt fuel, about 10 seconds later there was a loud thump. Smoke/flames were pouring through holes in the firewall aswell as reaching through the hoods panel gaps. I turned the car off and coasted to the side of the road with the whole front end in flames. Meanwhile I was on a bridge in a tight redwood Grove when the fire ignited, so stopping in the road would’ve blocked traffic in both directions. Luckily the turnout was about 50ft away. Once the car was stopped I got out as quickly as I could, the interior was growing very hot very quickly, The light from the flames was illuminating the footwell. I briefly looked at the severity of the fire as smoke and flame reach around the hood, up the wheel wells, seams, and windshield, then reached back in for the Extinguisher behind the seat. They arrived about 10 minutes later and the fire was beginning to pick up as fuel and plastic dripped under the car in a pool of flame. The above photo is as they arrived and the below photo was right after the battery blew up. The department got the fire out quickly, but Spent another 10-15 minutes trying to open the hood. Apparently the latch had broken so they had to tear into the front of the car with crowbars and an axe. It was not great watching something you’d spent so much time making get literally ripped apart before your eyes. One of them attempted to pop the hood off at it’s hinge(which didn’t work) and tore a fender I’d widened by hand off the car. (for no reason) But don’t get me wrong, they saved the car, and more importantly prevented a forest fire from happening. The fenders are the least of what should be worried about. Aaa was contacted after the fire was out, they quoted me a 2 hour max wait. After 2.5hrs I called them back and was quoted 10 minutes, 30 minutes later the tow company calls to tell me that they are 15 minutes away.... The fire started around 8:30, I got the car towed and dropped off by 12:30. 3 of those hours were aaa. The cool part(pun) was the tow truck driver had towed my car 2 years ago when it broken down and gotten it’s wheels stolen(among other things) this was actually his 3rd time towing this car. We both got a little laugh out of it. The fire was my fault, either by installing fuel lines that were not rated for the pressure(Apparently Napa only sells fuel lines for Carb’d cars) or by not tightening a fuel line clamp enough/ reusing an oem clamp with a rising rate fuel pressure regulator. 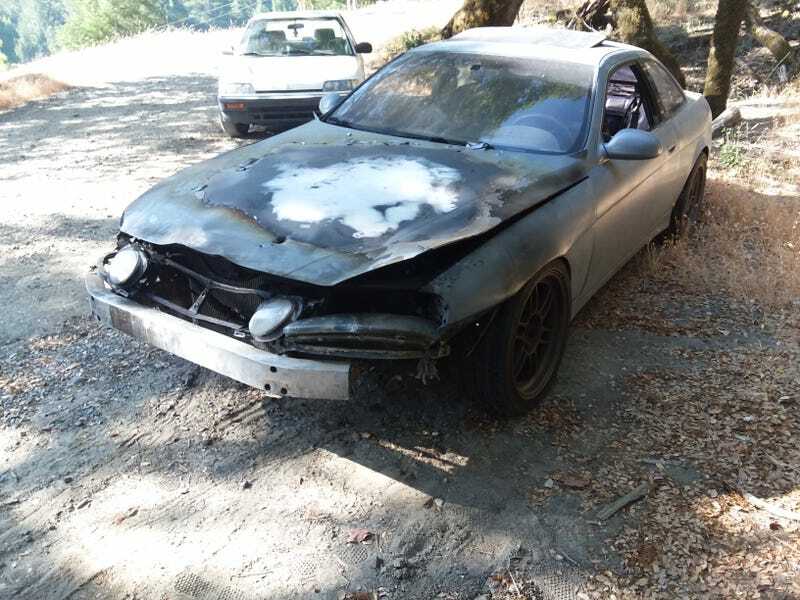 I would also say that although the Extinguisher didn’t fully put out the fire it may have kept my car from starting a forest fire or burning completely to the ground. I would recommend the slightly larger size (10lbs-ish) over those tiny ones you see in trailers. The next step is to buy a replacement sc400, which is what I will be doing after work today My brother and i will head down to the bay area and look at 2 cars I’ve lined up. The plan will be to pick one, drive it 4 hours home and then smog it. If it dosent pass then I will transfer it’s guts into the burnt out chassis. If it does pass than I will transfer the manual swap, suspension, and the turbo will be put on backburner until I can mount them in the engine bay(because rear mount oiling system and charge piping is proving too unreliable).